From Ottawa Start dot Blog: A photo snapped by Ben Wood, at the marina near Andrew Haydon Park in Nepean. 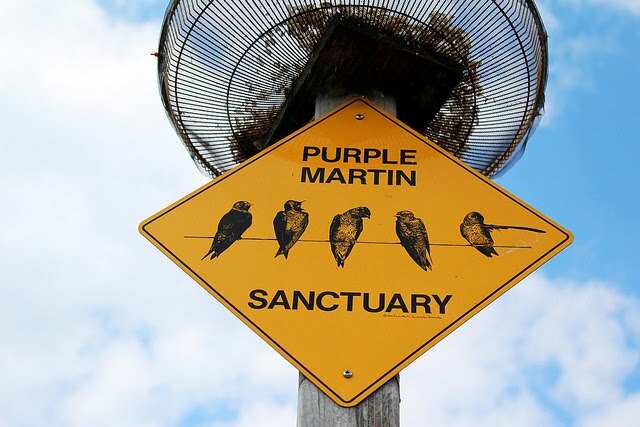 It's home to a couple of purple martin hotels. Every spring volunteers from the Innis Point Bird Observatory, tag all the nestlings and check on their health. They invite the public to come view this work and learn more about purple martins! The Green Apple Corps works to restore natural areas throughout New York City by doing intensive, hands-on ecological restoration work in the more than 12,000 acres of undeveloped parkland managed by New York City Department of Parks and Recreation. Corps members remove invasive and exotic plant species from forests, meadows, marshes, and freshwater and coastal wetlands, while helping to re–plant degraded areas with native species. Corps members also work to slow down erosion of slopes caused by inadequate drainage as well as foot and bicycle traffic, using cribbing techniques and materials that are designed to blend in with the natural surroundings. Additionally, throughout the program, Corps members take on exciting projects such as installing green roofs, building rainwater harvesting systems, and spearheading community plantings and coastal cleanups. The GreenApple Corps collaborates with several other restoration groups, including Parks’ Natural Resources Group, Prospect Park Alliance, Central Park Conservancy, Grow NYC and the Gaia Institute. The combined efforts of the GreenApple Corps and its collaborators allow for increased amounts of ecological restoration work to be done, while also giving Corps members the opportunity to learn from practitioners with years of field experience. 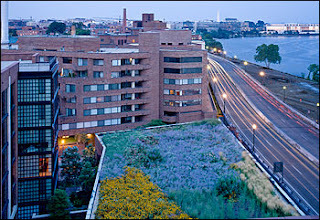 High above the bustle of Georgetown, an unusual rooftop offers condo residents a prairie of their own. Tom Carroll pulls up the birdsong application on his iPhone, summons the call of a song sparrow and points the device to the meadow that starts about 20 feet from his home. Sure enough, after a minute or two, an actual song sparrow starts calling back to the digital one. This might be little more than an endearing party trick if Carroll and his wife, Dora Marcus, lived on the edge of a field in, say, upper Montgomery County. But they live a little farther downstream on the Potomac River, in the shadow of Key Bridge. The meadow, perhaps Washington's greatest secret garden, is perched atop a Pepco electrical substation on the Georgetown waterfront. 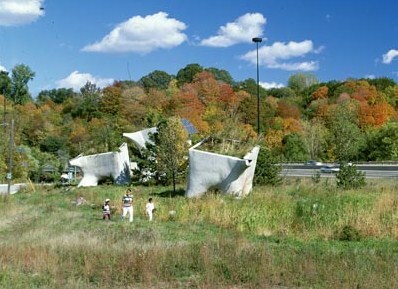 The straw-colored flower heads of a grass called calamagrostis are just visible for the most observant of motorists on the Whitehurst Freeway, and pedestrians on Key Bridge might glance back to see the fuzzy-topped brick substation, but there is no real public vantage point to view the full sweep of this prairie in the sky. This paradox is heightened during rush hour, when the freeway, Key Bridge and M Street NW are filled with weary drivers unaware of the meadow floating above them. The grasses give movement in the slightest breeze: The calamagrostis sways like pennants on wires on the meadow's southern edge, and the molinia stems shimmer veil-like on its western side. From high summer into fall, the full meadow goes through subtle color gyrations. For Carroll and Marcus and their neighbors, the garden presents layers of color and texture, and a kinetic quality augmented by the birds. Mallard ducks, doves, sparrows, goldfinches and other species find both refuge and food here. In this 10,000 square feet of meadow 42 feet in the air, they thrive unmolested by cats, raccoons, people, snakes or floods. Only landscapers have access to the plants, and they must use long ladders. "Nobody picks the flowers," said Marcus, chuckling. And yet from their fifth-floor, two-bedroom condo, it's almost as if you can reach out and stroke the grasses. Look to the right, and the meadow forms the ground plane for a view of Key Bridge with the Rosslyn skyline behind. Look downriver, and the garden frames a vista of the Potomac curving before the Watergate and the Kennedy Center. With the balcony door open, the apartment is filled with the whooshing of cars on the Whitehurst Freeway and the growl of jets twisting their way to Reagan National Airport. Close the door, with its soundproofed glass, and the scene shifts to one of surreal silence. The calamagrostis continues to dance. Marcus and Carroll live in the plush condo building known only by its address, 3303 Water Street. The nine-story building is sandwiched between the freeway and the C&O Canal, and contains 72 apartments. It looks like a converted factory or warehouse but is only five years old and stands on a site that used to be occupied by electrical transformers and a canalside hill. The garden was planted and is maintained by Washington Landscapes, whose owner, Peter C. Dickens, lives in the condo building, though his view is of the C&O Canal. His 10-member crews spend a day on the roof each month between March and December. The gardeners gain access with long extension ladders tethered to the roof's parapet. Wearing rock-climbing gear for safety, they use ropes to move material on or off the roof. 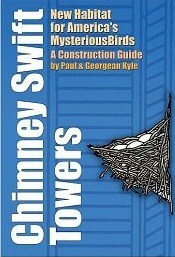 They check the irrigation system and hand-pull weeds and any little trees that the birds have brought in. All the dead top growth of the grasses and perennials is cut and removed in late winter. Maintenance is funded by the residents' condo fees. In the spring, thousands of daffodils sway in the April breezes. By June, the herbaceous plantings provide a textured carpet of green against the rose pink drifts of Nearly Wild and the oranges and yellows of daylilies. By July, flowers erupt for a summerlong display, including the wispy violet blossoms of the Russian sage, the golden black-eyed Susans and the azure blossoms of the chaste tree. The roses just keep blooming. When visitors see the meadow "they say you've got your own Serengeti," Marcus said. "They can't get over it." Adrian Higgins is a staff writer. He can be reached at higginsa@washpost.com. The Stevens Point Sculpture Park is working in partnership with the Aldo Leopold Audobon Society to develop and install two or more sculptural objects that can function as chimney swift nesting towers. 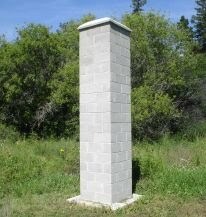 From 2006 to 2011, the Manitoba Chimney Swift Initiative received funding from the Manitoba government’s Sustainable Development Innovations Fund (SDIF) and from Environment Canada’s EcoAction Community Funding program. The project has also received support from Manitoba Hydro and other institutions. In 2008, swift towers were erected in Starbuck, St. Adolphe, Portage la Prairie, and Winnipeg. In addition to watching these sites, the group continues to identify and monitor roosting and nest sites around the province. 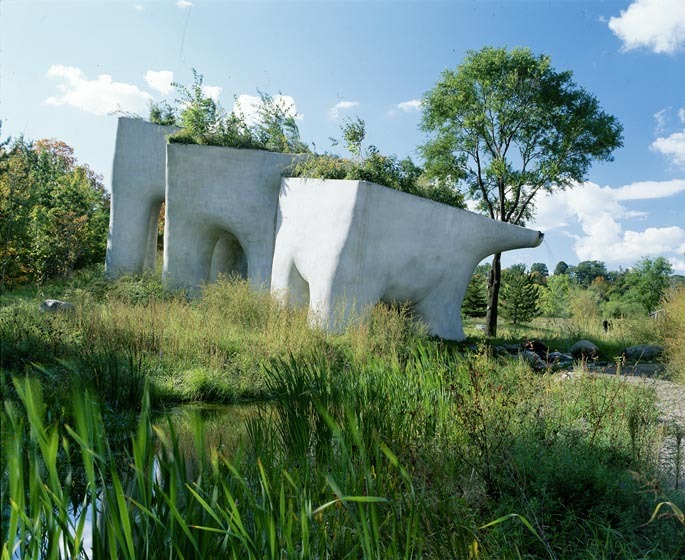 The Canadian Plastics Industry Association commissioned Noel Harding, to create "The Elevated Wetlands:" a plastic-based, functioning, ecological sculpture. The initiative informs the public of the usefulness, resourcefulness and aesthetic appeal of recycled plastics. "The Elevated Wetlands" is located right beside the Don Valley Parkway, one of Toronto's busiest highways next to the Don Mills Road exit and the Don River. Solar-run pumps draw water from the polluted Don River into the ponds below the six raised plastic "planters." The water is pumped from the ponds to three of the planters where it flows into three others. 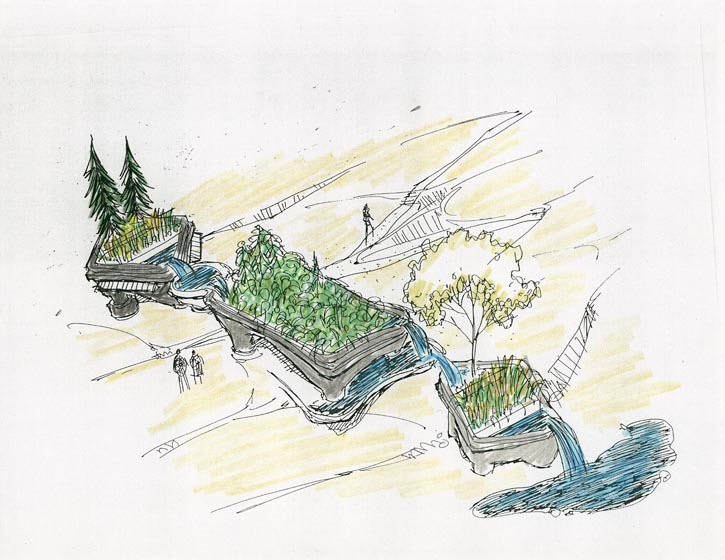 The structures use a recycled plastic "soil substitute" to promote vegetative growth that isolates and retrieves wastes, toxins and other impurities from the water. The project was inaugurated on October 1, 1998.